In Quebec, amateur and professional genealogists alike have access to a rich collection of documents to trace their family roots and draw family trees. 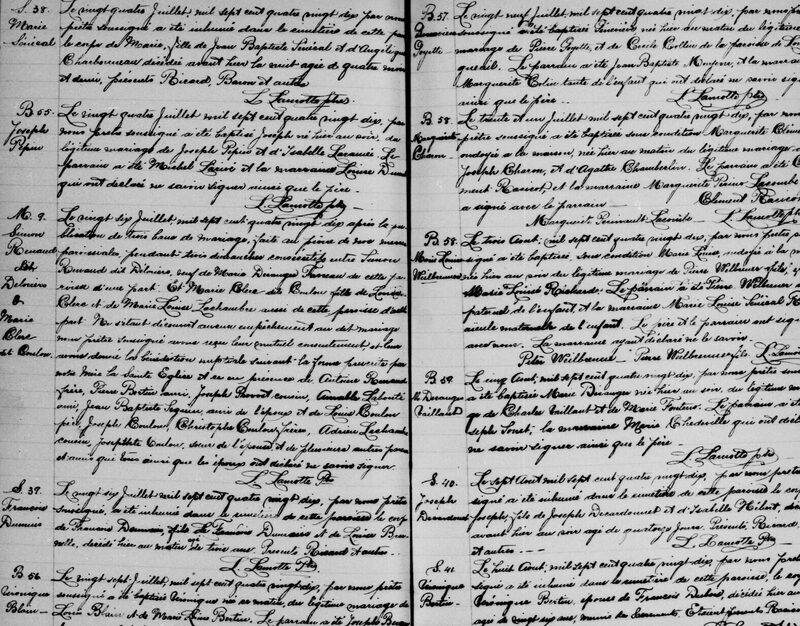 Since the days of New France, documentation of birth, death and marriage certificates was advocated by the Catholic Church to keep track of the families that established in these territories. The collection of this data has continued over time, so that today, it can be used to perform extensive genealogical research. The documents are filed among several registers and collections, including the Drouin Collection, which contains Quebec’s marriage records. The latter includes several elements of documentation about weddings that took place within the province, including copies of marriage records. These documents have been indexed and meticulously categorized by specialists. It is possible to consult them by becoming a member of Genealogy Quebec through the Drouin Collection Records or the LAFRANCE. Given the incredible number of documents collected and indexed in the records through the years, it was important to develop sophisticated search engines to better navigate through these informations. These tools allow to search precisely and trace relationships among individuals. The 1926-1997 marriages and deaths tool is part of the range of tools for exploring the available documents. The vast majority of marriages and deaths that occurred during those years were documented with this tool, itself equipped with a search engine. Thus, anyone who is doing genealogical research and knows that the parental relations they want to discover or confirm took place at that time will probably find useful documents. Other research tools are suitable for other periods. Therefore, it is possible to find marriage certificates having taken place in Quebec during the 17th, 18th and 19th centuries by using LAFRANCE. By doing so, genealogical portraits and related research are relatively easy to implement and support with several documents. This is a richness that is not available for all, because for many centuries, Quebec was particularly disciplined in keeping these kinds of records. One must know that certain practices can complicate searching in these databases, including the spelling of names that may have changed over time. During research, it is advisable to first search more generally, limiting oneself to a family name and a date, if they are available. Then, if necessary, it will be possible to add parameters to refine your search. This technique increases the chances of finding relevant documents. If the results are inconclusive, the family name might have been written in other ways. The person conducting the research will then expand his or her search fields, for example using the character % as a result of the common root of the name (ex: Beau% to search for Beauregard, Beaulieu, Beaudoin, Beaudry, etc.). This form of research is broader and therefore slower, but it allows one to find documents that might otherwise go unnoticed. Why Use a Register of Marriages for Genealogical Research? Talk to any genealogy experts and they will tell you that registers are inexhaustible resources for tracing family ties to discover or confirm already known elements. The information found in these registers is usually very reliable. It has always been in the interest of religious and governmental authorities to collect very specific data about the province’s population. Today, genealogists continue to develop and improve these research tools, including those associated with the Quebec marriage records.